Should We 86 the 9 to 5? It was 6:30 a.m. I knew because I could hear my dad barreling down the hallway and into my room. “The sun is barely up and it’s already a great day,” he would say to me in a booming voice. I certainly couldn’t tell how happy the sun was after he flicked the light on in my room considering it was still considerably dark outside. In my teenage and hormone-fueled disposition, I would grunt and abruptly turn the blankets into a cocoon. I was not the morning lark my father was. His quick-witted banter, loving nicknames, and persistence in rising his night owl were clear indicators of the tendency of the early bird’s worm victory. Though this may not seem like a science-laden claim, the truth is: there is biological and naturalistic evidence to support that each human has very different needs when it comes to sleep. Chronotypes are what they’re called and they are the explanation to why you may find that even with months of a certain shift, your body still hasn’t adjusted to the hours you keep. 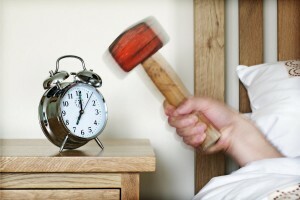 Are you a snooze slapper or an early riser? Just yesterday, an employee of my company walked in after waking up an hour later than normal for her shift and exclaimed how awake and productive she already felt. Knowing that this employee has night owl tendencies could be important to understanding when she will be more helpful in accomplishing company goals. Night owls are those people who have a hard time falling asleep at night no matter what time they woke up in the morning, while morning larks/early birds are those who fall asleep early and wake up with or before the sun. Don’t fit either of these? Then you’re known as a hummingbird. Studies of a gene called PER1 have lead researchers to believe that 16 percent of the population are night owls, 36 percent are morning larks and 48 percent are right in the middle (hummingbirds). How can an office be suited to both the night owl and morning lark? Though western culture accepts the need to wake up to an alarm with sleepy eyes, evidence shows that adjusting the workday to our body might be more of a winner than doing the opposite. Companies offering flextime see more engaged employees and turnover rates of less than 5 percent. Having more choice in work schedule could save $15 million a year by reducing absences and stress. Accommodating – or lack thereof – your employees’ sleep schedules can mean the difference between extreme productivity and lethargic deadlines. When our brain cells work, they produce waste product that needs to be removed in order to prevent neurodegenerative diseases. Because this process is energy intensive, our awakened bodies are only working at about 5 percent of their performance capabilities. Sleeping boosts the process speed and efficiency by shutting all the normal awake processes (movements, thoughts, memories and signal analysis) down, switching to clean mode. The truth is that when my dad jarred me from my sleep for school, I was not reacting as either chronotype. I was being a teenager. Most humans wake up the latest in the years of 13-21 than any other time in their lives, but that doesn’t mean you don’t feel the toll of working early in the morning as an adult. Many professionals accept that waking up to alarms, drinking coffee for boosts and being too tired to sleep at night is normal. While it is impossible to change your genetic chronotype, it is possible to trick your body into gliding through work schedules and social calendars. Bright light is the answer. Owls should brave the drawn curtains and shed light into their mornings by leaving open the shades and going for a walk or run as soon as you wake up. Larks who have the late shift should do the opposite with active evenings and bright lights at night. Whether you are a morning lark or night owl, you will probably find that your sleep schedule interferes with your work life, social life or anything in between. By learning your routine and changing a few habits, you can survive that jet lagged business trip or end of the quarter overtime.